Let’s face it… Today’s world looks much different from the one of ten, twenty, or thirty years ago. From changes in technology, communications, and culture, society has evolved at a dizzying pace. We would be naïve to think that education can’t, or shouldn’t, evolve with it. Our parents and community expect that we will do everything possible to meet today’s students where they are and provide an innovative, high-impact educational experience that will prepare them for future success. For many months, the administrators at Cora Cox Academy and Dobyns-Bennett High School have been examining their current educational programing and envisioning the full scope of what secondary education could look like, especially for the student that is not as likely to find success in the traditional high school setting. Out of that extensive research and planning led by Mrs. Shanna Hensley and Dr. Chris Hampton, D-B EXCEL (Excellence in a Creative Environment for Learning) was born. This innovative approach to personalized learning takes the core foundational philosophies of KCS and places them in an environment that better fits today’s non-traditional high school student. The campus is unique, providing opportunities for online learning, blended (both online and in-person) learning, and even a planned full-time virtual academy. Schedules are unique, with classes even offered outside the traditional school day, often going late into the afternoon and evening. This is especially helpful for students that have work or family responsibilities that keep them from maintaining a traditional school schedule. And the learning is especially unique. The coursework allow students to craft a more individualized learning path and provides the versatility to work at a much more personalized pace. By providing counseling, mentorships, and a positive school culture, staff can assist D-B EXCEL students in maximizing their academic potential in a truly innovative way. The intended outcome is to open doors and opportunities to a world of possibilities where students are empowered to focus on their own specific goals. It’s a game-changer for secondary education not only for Kingsport, but for the entire region and state (the virtual academy is planned to open in 2015 to any Tennessee student). Is it for you or someone you know? Find out by accessing a wealth of information available at www.db-excel.com. 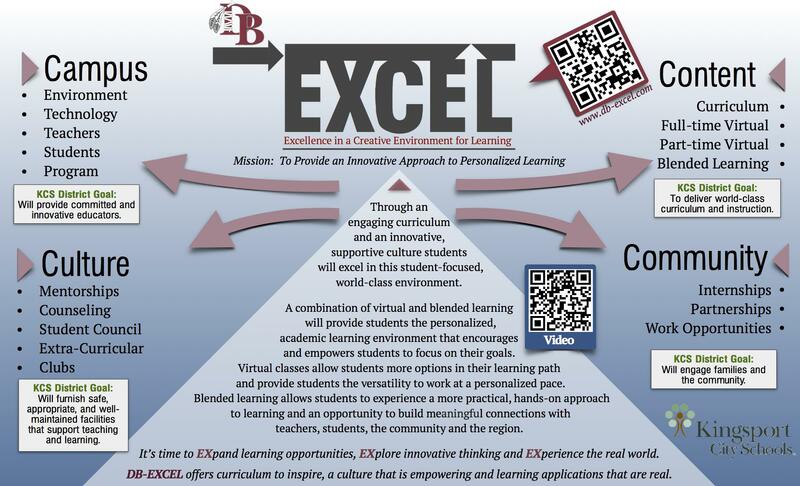 D-B EXCEL… It’s a progressive leap forward in creating a world-class educational experience for all students, providing an innovative approach to personalized learning. We Are Groundbreaking … We Are KCS!